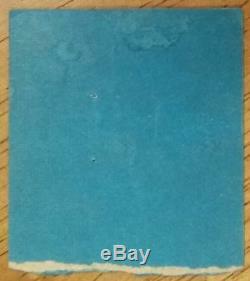 1972 JOHN LENNON Rare Original Concert Ticket Stub (New York, NY-Madison Square Garden). This particular ticket stub is taken from the evening set. This would be John Lennon's last full concert prior to his untimely death in 1980. Other artists to appear at this charity concert included Stevie Wonder, Roberta Flack, Melanie Safka, and Sha-Na-Na. I have not seen ticket stubs that often over the years to these Willowbrook State School charity concerts. This is your chance to own a ticket stub to John Lennon's last ever full concert performance. Please check out my other auctions for more rare concert ticket stubs/music magazines from the 70's/80's. Old concert ticket stubs are some of the most sought after items amongst Beatles music fans and collectors. 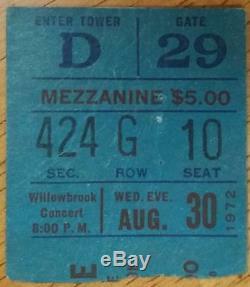 This concert ticket stub would make a great collectible for any John Lennon/Beatles fan or collector. Don't miss out on this rarity. Ticket stub measures approximately 1.75" by 2.00". Back of ticket stub has some minor water staining along with a couple of pinholes. Otherwise, ticket stub is still in good condition with normal creasing. Also, there is no tape residue or writing on ticket stub, either. The item "JOHN LENNON-The Beatles-1972 RARE Concert Ticket Stub (MSG-Willowbrook)" is in sale since Saturday, February 2, 2019. This item is in the category "Entertainment Memorabilia\Music Memorabilia\Rock & Pop\Artists B\Beatles\Concert Memorabilia". The seller is "pjcas" and is located in New Kensington, Pennsylvania. This item can be shipped to United States.